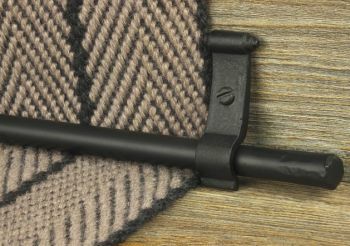 Blacksmith plain flat range of black wrought iron stair rods designed by Northumbrian Blacksmith Rodney Brittain. Each rod is individually shaped from a ½ inch (12mm) solid steel bar, then given a protective coating to prevent rust. These rods are hand made to stock lengths, and are ideal for runners and fitted carpets - tip to tip measurement required.